Nagorno-Karabakh is a region in modern Azerbaijan that has historically had a substantial Armenian majority and used to be home to ancient Armenian kingdoms. Under the Soviet Union, the mountainous region had the status of an “autonomous province” or oblast within the borders and was formally a part of the Azerbaijan Soviet Socialist Republic. Amidst the ethnic tensions that broke out in the late 1980s with the impending collapse of the Soviet Union, the oblast declared its intent to secede from Azerbaijan, with Armenia’s military assistance. This led to a protracted war between Armenia and Azerbaijan that resulted in a ceasefire in 1994 and the Armenian army securing Nagorno-Karabakh. Armenia also seized control of the Lachin Corridor, a mountainous region that serves as a corridor to the discontiguous Karabakh enclave, as well as a ring of territory around the administrative borders of the erstwhile oblast. While the Armenian army remains in control of the territory, it is notionally under the authority of the Nagorno-Karabakh Republic (NKR), an entity not recognized by any UN member state except Armenia. Nagorno-Karabakh styles itself an independent state, but lacks international recognition and is entirely dependent on Armenian military and financial support. The United Nations, as stated in GA Resolution 62/243, regards Nagorno-Karabakh and the surrounding region (amounting to approximately 16 percent of Azerbaijan) as Armenian-occupied territory. This view is shared by the United States, the OSCE Minsk Group, which reports on the “Occupied Territories of Azerbaijan Surrounding Nagorno-Karabakh,” and the European Court of Human Rights. The war displaced nearly one million Azeris from Armenian-controlled territory, and these refugees have not been allowed to return to their homes. Moreover, in recent years the Armenian authorities have implemented a highly organized program to encourage ethnic Armenians to settle in the occupied territories, which Azerbaijan has denounced as a war crime. 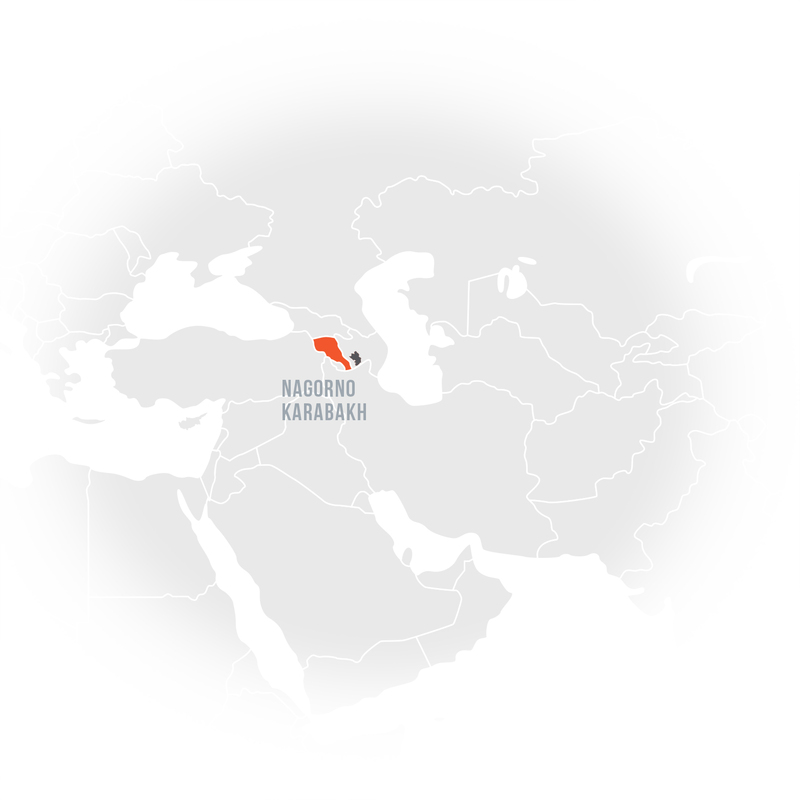 Baku prohibits foreigners from entering the occupied territory under Armenian or NKR auspices and vigorously protests foreign business ties with the territory. Nonetheless, a report released by Azerbaijan's Foreign Ministry last year documents broad and extensive foreign investment in the territory, as well as exports of its products and exploitation of its natural resources. Baku has repeatedly called on countries and United Nations agencies to take steps against foreign trade with Nagorno-Karabakh, but these calls have never been heeded. See CIA World Fact Book: Azerbaijan. Sargsyan v. Azerbaijan, E.C.J. (Grand Chamber), Judgment (Merits), par. 23–25 (1995). “Legal Opinion on Third Party Obligations with respect to Illegal Economic and Other Activities in the Occupied Territories of Azerbaijan,” May 25 2017, http://hague.mfa.gov.az/en/news/4/3316, submission to the UN institutions and official registration with the UN archive and submitted documents. See, e.g. Letter from the Permanent Representative of Azerbaijan to the United Nations addressed to the Secretary-General, “Legal Opinion on Third Party Obligations with respect to Illegal Economic and Other Activities in the Occupied Territories of Azerbaijan,” A/71/880, April 10, 2017, https://documents-dds-ny.un.org/doc/UNDOC/GEN/N17/113/60/PDF/N1711360.pdf?OpenElement.